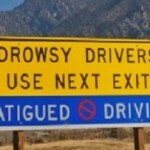 California Highway Patrol Reminds Us – Drowsy Driving Causes Auto Accidents! These are startling statistics and should be a stark reminder to us all that just like we cannot get behind the wheel stoned or drunk, we should likewise not operate a motor vehicle when we are feeling sleepy. Drowsy driving is dangerous and causes people to engage in life-threatening activities like “micro-sleep” (brief periods of up to 20 or more seconds where the driver is actually asleep behind the wheel). When the driver wakes from hitting bumps or grates in the road, they have a high incidence of jerking the wheel which can lead to flipping the car from being caught on the lip of the road, unsafe lane changes colliding with other vehicles and many other scenarios where serious auto accidents can occur causing injury and death. What should you do if you find yourself dozing off behind the wheel of a car? Drowsy driving leads to thousands of car wrecks every year in California and these are some of the most preventable auto collisions. Start with a good night’s sleep and follow the advice above and you could keep someone from being maimed or killed! Victims of drowsy drivers can include both passengers in the driver’s vehicle as well as drivers and passengers in other vehicles that collide with the car or truck of the sleep deprived motor vehicle operator. There are many legal aspects of trying to recover medical expenses and pain and suffering damages in these types of traffic collisions. If you are the passenger in the car or truck operated by the fatigued driver or the driver of a vehicle impacted by that operator, you would need to file a claim with the driver’s insurance carrier. If that driver has minimal insurance coverage, you may also need to file a claim for underinsured motorist coverage with the vehicle in which you were traveling. In the case of drowsy truckers, you would need to present a claim with the operator’s insurance policy or the insurance carrier for the company with whom they were employed. No matter which insurance carrier is involved, that claims representative will immediately start taking precautions to minimize the payout by trying to downplay or discount any claims that the driver was drowsy at the time of the incident. It is crucial that you have your own legal team to properly investigate these allegations through obtaining witness corroboration of how the vehicle was traveling just prior to impact, analyzing the findings of the police report from CHP or any other law enforcement agency including measurements of skid marks and impact points, issuing subpoenas or demands for production of driving and rest and sleep records (in the case of truckers or other commercial vehicle operators), retaining the expertise of an accident reconstruction expert to analyze the crash and events leading up to and following the impact, and taking all other necessary steps to lock down the cause of the collision. It is vital that a lawyer be retained quickly following the incident so that evidence can be analyzed while it is still “fresh” and before it goes stale. 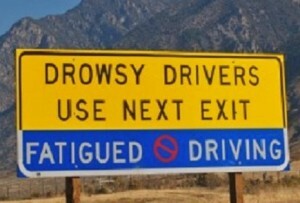 Drowsy driving accidents continue to happen thousands of times every year in California. Don’t become a victim of this type of carelessness and not obtain the proper legal representation that you deserve to ensure that people who irresponsibly operate cars and trucks while sleepy are not held accountable when they cause injury and death!